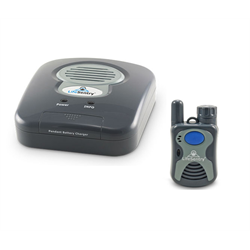 The Logicmark 37911 LifeSentry system provides emergency call and two way voice communication when used with a professional central monitoring station so that trained professionals can assist when the need arises. This is a professional installer model only and not meant for do-it-yourself or self monitored applications. The pendant is fully supervised and automatically checks in with the station every 13 hours. When the help button is pressed, the LifeSentry base station will call the central station through the home's telephone line, and the user can have a two way conversation to ask for help or explain the situation. The pendant communicates through the base station wirelessly and comes with a lanyard to wear around the neck, as well as a wrist/wheelchair strap. An emergency HELP wall button may be purchased separately to add an additional help call point.